You may have a website for your company and it may look great too. But is it getting you traffic and more importantly leads or sales? Do you even know how much traffic you’re getting? If not ensure you get Google Analytics setup (it’s FREE) or if it is get your designer to add you to the user’s who can access them. Most business owners feel once they have a website they can tick that box. Sadly although they have a website, many sites are poorly setup for search engines missing crucial information that would raise you from the depths of search rankings, to be a leading result. Higher rankings will get you more traffic, Fact. Here’s a list of things you can check today about your website and either fix it now yourself or get someone cracking on it, so you stop leaking potential new business by not being found where it counts online. So what’s important to check for? Why is a page title tag important? Think of a textbook from school or uni. The title tag is like the title of a chapter in the book. Just about every website has some form of title tag, yes. However typically they are something like: “your business name” or “welcome to…” of “home…” all of these are essentially wasting the potential power that the proper use of this tag can give you. In some searches we’ve seen just this tag being updated providing a boost to the front page for a website. Tip: It’s important to note that page titles must be unique across your website. Typically clients give us a huge list of keywords they want to rank for. 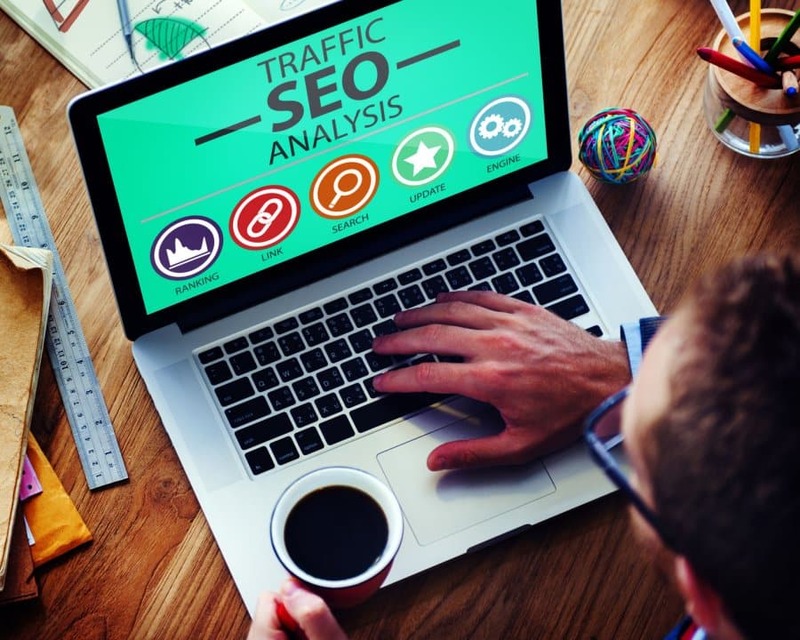 But modern SEO means that many keywords can rank by providing good content and associating words and terms. For instance in our industry, Web Design is similar to Web Designers, Website Design, Website Design Services etc… Google is smart enough to associate similar words. So the focus should be on relevant keywords that can get you the most traffic and only one per page. The current recommendation is to put your targeted keyword first. Then is you have room your company name. 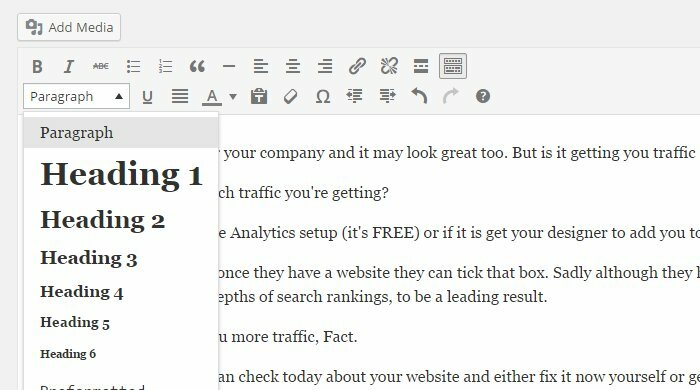 Tip: You only have 70 characters for a page title. Google and other search engines ignore all text after that. If your title tag is too long you’ll see … cutting off a title. If you have a Content Management System [CMS] you should at the very least be able to do this. On most CMS’s you will find place to edit the Title Tag where you can make edits to that page, often near the bottom. Sometimes the page name is simply made the page title, but we recommend you put more effort in than that, you’ll get more as a result. The META description tag simply tells search engines what your page is about. Getting back to our example of a textbook, a description is like the brief caption after the chapter of the book, telling you what the chapter will be about. Why is a META Description tag important? Google and other search engines do also pay attention to your META Description tag. This tag should be telling Google what this particular page is about, and they use this information in their search results, see again where the description is found in the search results. Again don’t overdo it on keyword use, this is displaying in Search Engine results – you need to make it compelling to potential website visitors – so it should contain a strong call to action. Ask a question, provide a solution, or simply state what this page is about. It would pay to have your keyword in there, but don’t stress about exact match for your keyphrase and overdo it, make it human friendly. Again you should be able to do this with you CMS. You’ll find it in a similar area to the Page Title. If you don’t have a META Description, then a search engine will default to the first readable text it can find and often that produces horrible result information. What is a Heading <H> tag? This is a little tricker, but again the reason most websites rank poorly. A Heading tag <H1>, <H2>, <H3> etc… normally appears in the content of your page as titles that stand out. The different numbers indicating differing levels of importance. Check out the title above of this post and it is a <H1> heading. The various bullet points and sections in the actual post content are a mix of <H3> and <H4> tags. Getting back to our example of the textbook, Heading tags are just like the section headings you’ll get throughout a chapter of the book. They are a way of organising content and they draw a search engines attention again to what you find important on a page. They are critically important. Most website reviews we do for clients who have poor rankings reveal that they either have no Heading tags at all, or a heading that says something useless like: “welcome to our website”… That’s the most important thing you’re telling Google? It is ideal where you can to include 1 x <h1> tag, 2 x <h2> tags and 3 x <h3> tags. That isn’t set in stone, but we’ve seen where too many tags can get a site penalised (especially <H1> tags), but no tags will definitely affect your website’s rankings. Don’t use all the same Headings though, use like words and add words before, after and in between so it all makes sense, search engines are getting pretty smart nowadays. What are local citations and links? The first three points all covered things you can do on your website to improve rankings, this is called on-page optimisation. But there are also off-page factors that need to be taking into consideration. To keep it simple, links from other relevant websites can give your website a boost in rankings, because they make search engines feel your page is ‘popular’ or contains information that other are linking to so it should pay more attention to it to. You can’t go overboard on backlinks like many did in the past when this first became part of Google’s ranking algorithm. Google will and does penalise websites for poor quality backlinks. Citations are references across the internet of your NAP, that is your Name, Address & Phone Number. The best place to find these are on directory sites like Yellow Pages, True Local & Start Local business directories, but there are over 30 core directories and many more niche directories for different industries. Citations even if you do have heaps of them, can bite you in the backside. Many businesses have conflicting names (even Typos), old addresses and phone numbers. If it isn’t consistent across ALL directories this can harm your website rankings. It’s one of the major factors in ranking for local search factors, and just about everybody including web designers miss it. Check your citations on other websites, but there aren’t a lot of free tools out there. We use a special paid service that allows us to provide a comprehensive report all all citations and other tools that can help with backlink checking. Any references to your company MUST MATCH. Same, Name, Address & Telephone number. Feel free to contact us to discuss generating a report for your company and website. It is definitely worth it. Finally one major thing you can do today to start improving your rankings is get more content onto your website. There is plenty of evidence out there now to indicate that Google is favouring websites with lots of content. That’s not only a lot of pages but also on the pages themselves. Tip: Page word counts of 1,000 to 2,000 is now looking like the sweet spot. Remember that with increasing word counts, you can also use keyphrases more and also use different associated types of words. 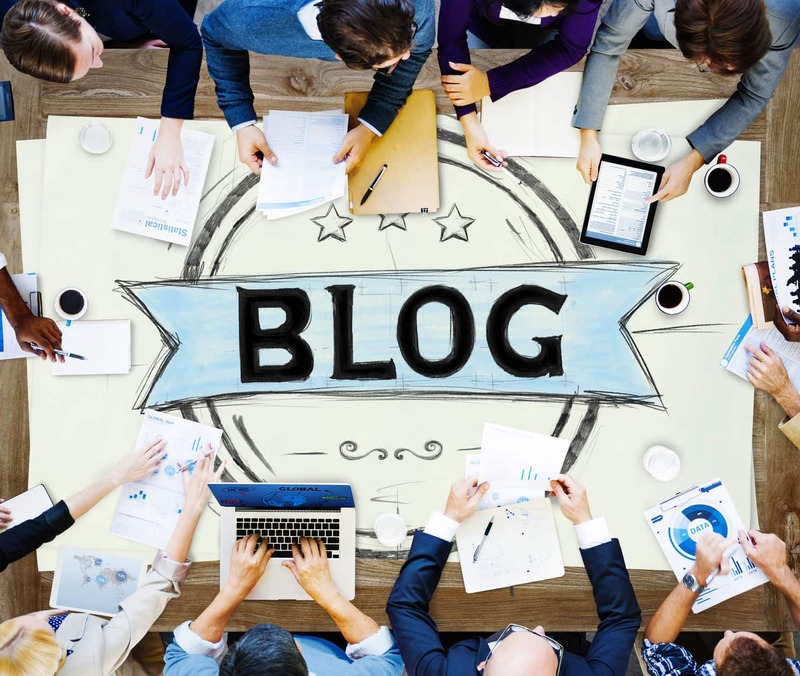 The easiest way to add more content is to add a blog to your website. Yes this adds work, however it absolutely does pay off (one recent survey indicated an average 13 times return on investment for many companies that use a blog). What do potential clients call you about? What frequently asked questions do they or your existing clients have? Are there helpful tips and tricks to something in your industry? Important dates, events or seminars you could inform about? There’s plenty for even the most ‘boring’ business to write about, and remember the main idea here is to broaden the content search engines have, so they can rank you for a range of things and hopefully rank you well for key terms because you become a trusted industry advisor. At natiive we work with clients to continually improve websites we’ve done for them, or to help fix websites done by other designers. If you need assistance let us know. Also if you’d like to check how your website stacks up compared to the information about, do a FREE instant website audit. You can check you website for a particular keyword and also compare with a competitor.